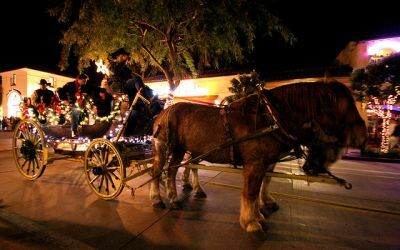 More than 65,000 spectators will line State Street in anticipation of Santa Barbara’s only nighttime parade, the 66th Annual Downtown Santa Barbara Holiday Parade, Presented by Consumer Fire Products Inc! Officially kicking off the holiday season, this signature Downtown Santa Barbara event brings a colossal contingent of high-stepping marching bands, fabulous holiday-themed floats, spectacular performance groups, local personalities, and our amazing, soon to be announced, Grand Marshal! The Holiday Prince and Fairy, selected from winning artwork best capturing the parade theme, will lead the parade and light up the community Christmas tree on their way down the parade route.